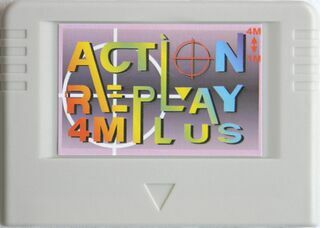 The Action Replay Plus, is a cartridge developed by EMS for the Sega Saturn as an upgrade to the Pro Action Replay. The cartridge has a wide array of features that make it a highly useful and sought-after accessory for Saturn owners, particularly those with non-Japanese systems. All versions of the cartridge have four basic abilities: to enable the console to play games from all regions; to function as either a 1MB or a 4MB Extended RAM Cartridge for use with more demanding games; to function as a Saturn Backup Memory cartridge; and, like many other products for various systems with the name Action Replay, to activate cheats for many particular games. Older versions only support 1MB RAM. In addition to these functions, the original incarnation of the cartridge included a communications port that enables one to link their Saturn to a PC for other purposes. This is not present in all versions of the cartridge, especially not newer editions. The cartridge has always been highly popular among Saturn fans, as its multiple functions means that it very rarely has to be swapped with another cartridge or removed from the console at all (Although the game Die Hard Trilogy is reported to have conflicts with it). It was kept in production for many years after the Saturn’s demise and is still fairly easy to find, though the original version with the communications port is much more rare and highly valued. Nonetheless, apparently, the circuitry is still present in all versions of the cartridge, and the port can be re-added through alterations to the cartridge. Although the cartridge is marketed as having been made by EMS, there appears to have been a connection to Datel, who own the Action Replay trademark; Datel sold the cartridge as the Pro Action Replay in markets such as the UK, although EMS ship worldwide. It remains to be confirmed whether newer cartridges, which are still fairly prevalent for a product of such an age, are/were made by EMS or anyone connected; or whether they are simply clones.